Japanese Knotweed is an invasive plant species that can cause destruction to building foundations, flood defences, driveways and much more. 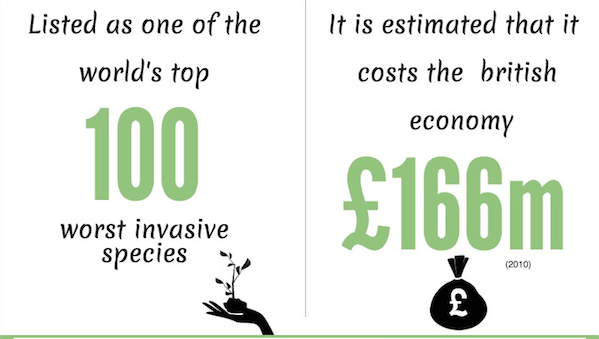 Japanese Knotweed is listed as one of the top 100 worst invasive species. 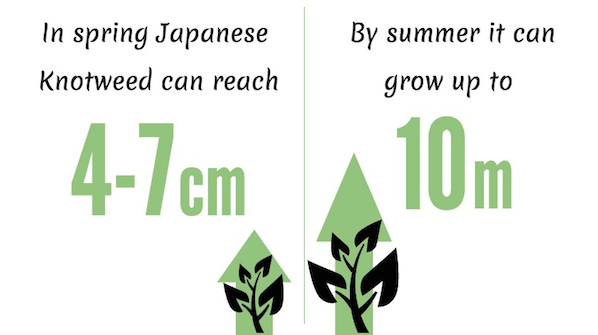 This is because it grows incredibly quickly and can break through hard materials such as concrete. Therefore causing severe problems to property infrastructures and projects which has contributed to costing the British economy £166 million. Japanese Knotweed can be extremely difficult to remove and the earlier you spot the invasive plant, the quicker it is to remove. 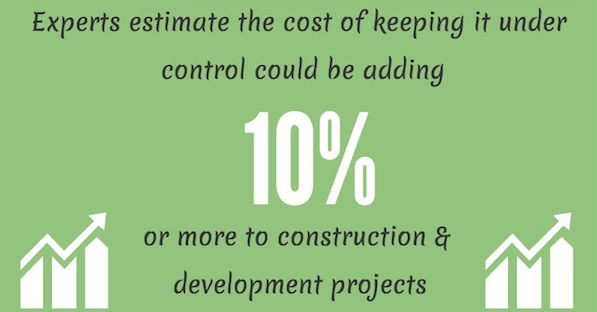 However, experts estimate the cost of keeping Japanese Knotweed under control could be adding 10% or more to development and construction projects. If you’re concerned about your project, you can get a free site assessment here. The invasive plant begins to appear in early spring and can reach 4-7cm. However, by the summer months this can grow up to 10m tall and therefore the need to identify the substance quickly and effectively is vital. The typical plant does not normally have the ability to break through hard substances. 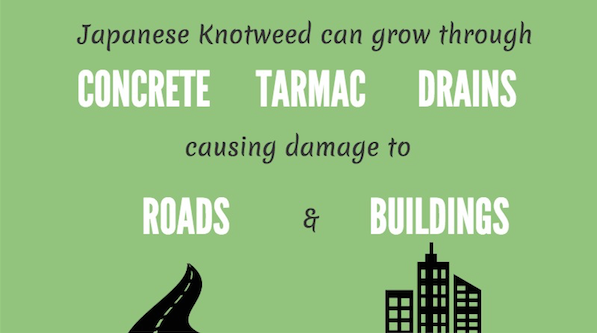 Unfortunately, this does not apply to Japanese Knotweed as the plant can grow through concrete, tarmac and drains. Resulting in catastrophic damage to roads, buildings and almost anything else in its path. It is estimated that there could be one infestation every 10 square metres in the UK. 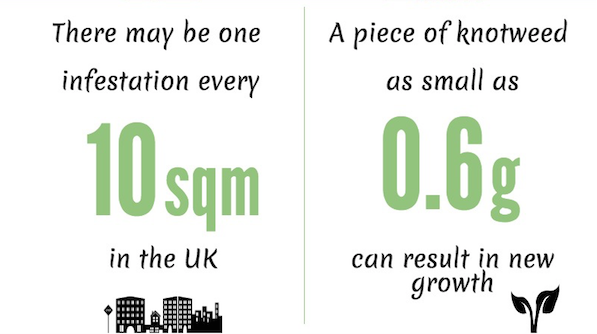 This is less surprising when you realise that a piece of knotweed as small as 0.6g can result in new growth and a new problem for property managers, surveyors and planners. 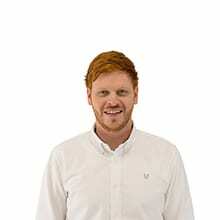 To be clear on the legislation around Japanese Knotweed you can read this article here. 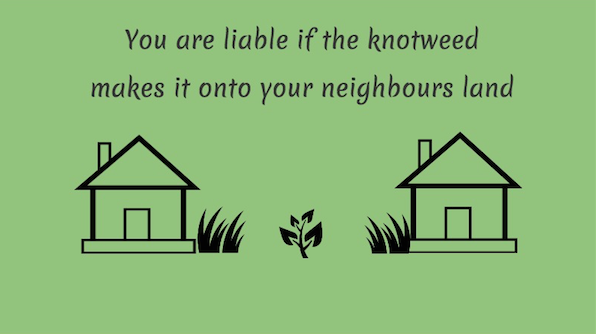 One key section does state that you are liable if the knotweed makes it onto your neighbours land. As Japanese Knotweed can grow incredibly quickly it is important to get the issue resolved and treated before it can spread to neighbouring properties.